Two of the best things about Archie Comics' line of relaunched titles like 'Jughead' and this issue, #11 in particular, is how charming and disarming they can be. Sure, it's still fun storytelling with broad comedy at times but there's a heart in the center of all those hijinks and Ryan North and Derek Charm balance it all out perfectly. 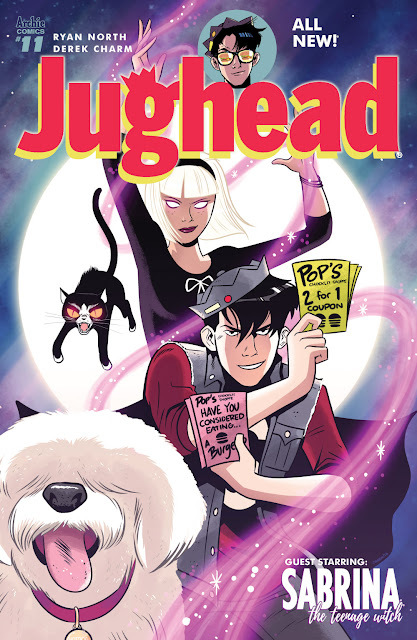 In closing out the story that started in the previous issue, North puts Sabrina's magical powers to good use creating a funny spell for Jughead and Reggie. It's a raucous affair that helps to fix the problems she created in the last issue. While it's the fun hijinks you'd expect the real story is the blossoming friendship between Jughead and Sabrina in the second half of the book. What started off as an awkward and painful date between them, Jughead redeems himself by coming clean about his weird behavior and Sabrina opens up about her new life in Riverdale. North flips the script on these characters making them more naturally conversational and empathetic towards one another. Jughead comes out a champ as an inspirational voice of reason. Charm lives up to his surname with wonderfully fun and joyous layouts that provide a great canvas for Jack Morelli's lettering. Even in the more tender moments when it's just Jughead and Sabrina talking, Charm does a great job conveying the angst and conflict in Sabrina's life. It's a multilayered sequence of events that test Charm's versatility and passes with flying colors. North and Charm close out this arc of 'Jughead' with probably the best heartfelt teen comedy you won't find at the movies. There's plenty of wild laughs but it's the organic chemistry between Jughead and Sabrina in the end that makes this issue an absolute winner.